Are you still looking for that special gift or card? Make your own special creations on Mondays, December 12 and 19, January 9 and 16, from 9-12 noon. Take one class, or as many as you like. It is sponsored by the Midcoast Printmakers, Inc. Classes will be given at their studio at the Round Top/ DRA Farm on Bus. Rt. 1 in Damariscotta. RSVP to Kay Miller @644-8849. The Midcoast Printmakers, Inc. a non-profit 501c3 organization which promotes the art of original printing. 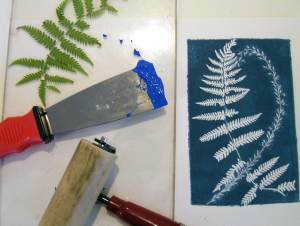 Frances Hodsdon teaches an etching class on Fridays while Holly Berry does linocuts on Thursdays. Call for more information on these continuing classes.